4 bed Villa in Rethymnon - 6595024 - Villa Kleanthi - Spacious Villa "Away from it All"
Need more information about booking Home 6595024 ? Villa Kleanthi is approved by Greek Tourism Organisation & managed by "etouri vacation rental management". Villa Kleanthi is a 265 sqm luxurious residence of superior design and construction quality! It is located in a private land of 5,000 sqm in a quiet village called Kare, offering full privacy and mountain views. It is literally a hidden gem around the beauty and tranquility of a uniquely green landscape of olive trees and vineyards only 15 km away from the long sandy beach which lies in front of Rethymno city on the North coast and 30 km away from the famous natural beaches of South Crete. 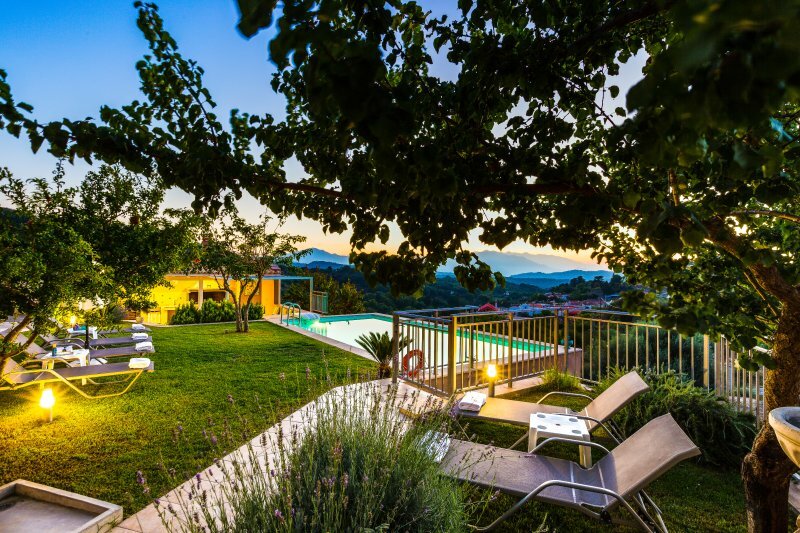 Furnished in a combination of traditional and luxury touches, the two-storey villa can accommodate up to 7 people in beds and up to 9 people if it is necessary. On the ground floor there is a spacious open plan area consisted of the living room and indoor dinning area. The living room features a comfortable siting area, fireplace, bluetooth speakers, HDTV with Netflix and home cinema. A few steps away, the separated, fully equipped kitchen is equipped with an additional dining table, top quality fixtures and appliances, allowing you to prepare your daily meals. From the living room area and the kitchen there is direct access to the main veranda, the pool area and the garden. On the same floor there is a laundry room with washing machine, one full bathroom with shower and two bedrooms, one of which features a double bed and the other one a semi-double bed. - Fully equipped charcoal barbecue area plus a wood oven and a sink under a pergola. - The location which is “away from it all” but close to everything! The villa is situated 15 minutes away from the city of Rethymno and the beach and about 30 minutes away from the famous natural beaches of south coast. It is also an ideal base for making excursions around the island as it is close to the national road in the centre of Crete.- Very close to Armeni village where you can find supermarkets and grocery stores. - Many unique beautifully landscaped aromatic herbs and flower gardens. - The hospitality of the owner and his family who will help you for everything and he will be there whenever you might need him! Each additional guest from 8th person is charged 35€ extra per day. This Villa has 4 bedrooms, 3 bathrooms and sleeps 9. It’s been listed on Holiday Lettings since 26 May 2015. Located in Rethymnon Prefecture, it has 11 reviews with an overall rating of 5. The average weekly rate varies from £1092 to £2851. Villa Kleanthi - Spacious Villa "Away from it All"